The implementing party of the Project is "North-South Road Corridor Investment Program", SNCO, on behalf of the Government of RA. The executing agency is the Ministry of Transport and Communication of RA. The owner is the Government of RA. The whole NSRC is part of the Asian Highway Network – AH81/82. 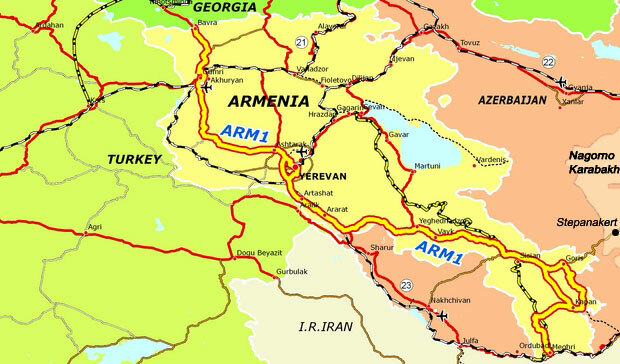 Project will be (i) a reconstructed 18.4 km four-lane section of the corridor between Yerevan and Ashtarak; (ii) improved safety of the Yerevan–Ararat road; (iii) due diligence, final design and bidding documents for tranche 2 and 3 projects; and (iv) execution of road sector institutional effectiveness plan. A preliminary road design for Tranche 1 Project has been completed and is summarized in Appendix 5. Tranche 1 Project is ready for bidding under advance contracting. Project may include (i) upgrading an 88-km Ashtarak–Gyumri section of the corridor, (ii) developing a cross-border agreement with Georgia, (iii) undertaking feasibility studies and completing the design of subsequent tranches, (iv) improving border infrastructure, systems and procedures, and (v) completing the implementation of institutional effectiveness reforms. Subsequent tranches under the MFF will complete the upgrading of remaining parts of the north–south road corridor. The Intergovernmental Agreement on the AHN entered into force on 4 July 2005, under the auspices of UNESCAP. The investments will benefit all the countries in the region and ultimately connect the Caspian Sea to the Black Sea. The major economic benefits of the Project are savings on vehicle operating costs and travel time because of improved road conditions. These savings were calculated using the Highway Design and Maintenance Model (HDM-4) model. Travel time savings for passengers were calculated at $2.50 per hour for work-related trips—the average hourly wage rate plus an overhead factor of one-third. For non-business trips, one third of the value of the work time saved is used as a proxy for willingness to pay. The time saved for freight is estimated at $0.3 per ton per hour as defaulted in HDM-4. It is in line with a load of 2 tons with a value of $10,000 per ton. The time savings for freight are, however, minor as freight traffic constitutes only 5% of forecast traffic. The Government of RA finances $10.0 million equivalent in the form of local taxes and duties. The share assigned to ADB over the next few years is USD 500 million. Some arrangements are made with JICA Japan International Cooperation Agency for co-financing contribution in further tranches.the next few years is USD 500 million.